All homes currently listed for sale in the zip code 90025 as of 04/24/2019 are shown below. You can change the search criteria at any time by pressing the 'Change Search' button below. "Welcome to 2016 Manning Ave! This spectacular Cape Cod Masterpiece is the last new construction in Westwood available from the old building codes. Located on a premier street mid block location and featuring the highest quality finishes throughout, this 3670 sq. foot light filled home has 5 bedrooms and 6 baths. Enter into a grand curving staircase with full wall paneling. Formal living room with fireplace, formal dining room, large kitchen with Wolf and Subzero Appliances, natural Carrera countertops and large center island and breakfast nook. Spacious family room with fireplace opening to the rear patio and large grassy yard with built in BBQ. Downstairs features an elegant powder room and guest bedroom with en-suite bath and large closet. Upstairs features 3 more bedrooms all en-suite and a large master retreat with fireplace, full wall paneling, shiplap cathedral ceilings and bi-folding doors opening to a large grassy backyard. Dont settle for for anything less, get the best!" "Beautiful Cape Cod Traditional in highly desirable Westwood neighborhood. Spacious bdrms & great open floor plan featuring custom hardwood floors, high ceilings, extensive custom moldings & cabinetry throughout. Gourmet cook's kitchen with top-of-the-line stainless steel appliances & granite counters. Center island, lg counter, & generously-sized family room with breakfast room. Formal dining room with double glass doors for privacy. Grassy yard with an outdoor fireplace, built-in BBQ & refrigerator. Downstairs also features a separate home office, guest bdrm & full bath. Large master suite with sitting area, fireplace, 2 walk-in closets & beautiful master bathroom with separate tub & shower. 3 other lg bdrms, laundry room & high hall skylights complete the 2nd level. Other features include wainscoting, 7.1 surround sound in family room & ample closet space throughout. Centrally located & close to the desirable Westwood Charter School District, restaurants, & shopping." "Brand New Masterpiece 5 bedroom, 6 bathroom over 4,500 sq ft of living space. Designer done, open floor plan with an amazing flow creating and indoor/outdoor atmosphere with fire-place perfect for entertaining. Gourmet Chef's kitchen with huge center island and top of the line appliances. Property features 2 fire places in the 1st floor (Living and Family room), wet bar, 4 patios throughout the house, with a lot of natural light from every room. Master Suite features a spacious balcony, walk-in closet, fireplace and exquisite bathroom. Located in a Prime Family area of West LA." "Modern farmhouse on one of most coveted streets in South Westwood. First floor has open floor plan with formal dining room, family room, kitchen & separate breakfast nook. Gourmet kitchen features top-of-the-line finishes, sleek tile backsplash, stainless steel appliances, & marble-covered island. Floor-to-ceiling sliding doors lead to grassy backyard that with a built-in BBQ. Guest bedroom downstairs could also be perfect for a home office. Relax in the home's second level including a media room, children's playroom & more. Luxurious master bedroom with vaulted ceilings, walk-in closet, dual sink vanity, separate soaking tub & shower. Three additional bedrooms with large windows & an abundance of natural. Centrally located & close to the desirable Westwood Charter School District, Century City, Westside Pavilion & restaurants on Westwood Blvd. As a bonus, this section of Thayer Avenue is the place to be on Halloween (for trick or treating) & on the 4th of July (triennial block party)!" "This newly reimagined & exceptionally sophisticated contemporary residence is a captivating showplace, designed for today's visionary. The interiors have been meticulously updated to a high standard, exemplifying high-end resort-style luxury. The home was built to feature a harmonious interplay between architecture and light. Each room is illuminated by unique & custom accent lighting; when paired with the white Italian Porcelain flooring it exudes a visually stunning effect that excites your senses. The thoughtfully designed chef's kitchen is minimalistic yet superb featuring a 12ft Quartz waterfall island, exquisitely tailored cabinetry, Miele Appliances including a built-in coffee system and double oven. Master bedroom is its own private oasis with an immaculately designed bathroom & customized walk-in closet. The backyard is an entertainer's paradise, equipped with a roaring fire pit, stunning rainfall waterfall, exotic landscaping & private spaces to lounge." "Unique architectural live/work property with 2 SFR on one lot. Designed and built by distinguished architect David Ming - Li Lowe, each loft like residence features many architectural details including bow truss roofs with exposed beams, glass garage door walls on the back home, and expansive balconies on the second floor. Front home has 2 BR + 2 Bth. Back home has 3 BR + 3 bths. Separated by a private patio, this fabulous compound offers the opportunity to live in an architecturally significant home with a separate work environment. Two private 2 car garages. Located in a hip West LA neighborhood in close proximity to the Expo line and some of the best sushi in LA. See private remarks:"
"A very unique architectural home located in the heart of West LA. This home features high ceilings, and an open floor plan that has a living room with wood burning fireplace and spacious dining area. Truly a home for an entertainer and cook, the open kitchen has a commercial oven and opens to a backyard .The lower level also has one bedroom and bathroom. On the second level there is a very large master suite with an amazing deck with lovely city views. There is also an open den/office that can be closed off and used as a third bedroom. This home also has a two car garage and wood floors throughout. This property is located behind 1529 Wellesley on the same lot." "Nestled on the end of a charming tree lined street in the heart of LA's Westside sits this brand new 4,040 sq ft contemporary residence with 4 beds and 3.5 baths. Enter a sleek foyer & family room w/ wet bar that opens out to grassy yard. 1st level incl. a guest suite, laundry rm, & elevator access. 2nd floor consists of great room filled w/ natural light, dining room, powder room, & gorgeous kitchen feat. stainless steel Jenn-Air appliances, natural quartz counters, & maple cabinetry. Master suite, 2 secondary bedrooms, & second laundry room are comfortably located on the 3rd floor. Beautiful engineered Oak floors are complemented by Porcelanosa tiling in baths & first floor. Wired for A/V in every room & comes w/ solar panels, 5.1 audio speakers in great room, dual speakers in master bed & bath, Lutron lighting control system, Navien tankless water heaters, & 6-camera security system. Providing both exceptional quality & value, this stunning house can truly be called home." "Modern New construction in the heart of West LA. Beautiful 3200 SF Single family home with the greatest materials and finishing. First floor has 2 bedrooms each one with in suite bathroom leading to your private patio, laundry room, bath, and two car garage attach to the house. Second floor has the living room facing modern sleek fireplace, dinning area and kitchen with Thermador 5 burner cooktop, refrigerator, dishwasher, expresso maker, wine cooler, natural stone countertops, walnuts cabinets and wall to wall windows. This house come with blinds through the entire place ready to move in. Security camera ready, wired for home security, speaker system ready for each room, master, living room, and roof top/deck, property is wired for additional speakers around the house. Smart Home System installed, fully wired for smart home integration, prewired for alarm system: Lutron radio RA2 lighting control, nest smart thermostat, TVI HD 1080 cameras installed (needs DVR), Automation system i"
"Located on a large corner lot north of Olympic in Westwood sits this charming 4 bedroom, 3 bathroom home. The inviting street presence and formal entryway and living room welcome you and your guests. The natural light-filled master suite consists of a spacious bedroom, upgraded bathroom, large closets, and a bonus office space. There are three additional bedrooms and two additional nicely appointed bathrooms. Dining area, family room, and remodeled kitchen open seamlessly onto the grassy backyard with sparkling swimmers pool and spa. Brick clad fireplaces complete both the living and family rooms. This warm and functional home is great for entertaining and perfectly located near Century City and other Westwood attractions. Located in the desirable Westwood Charter Elementary School neighborhood!" "Spanish home was taken down to the studs and renovated with a clean modern design. Features three en-suite bedrooms with large closets. Great walls for art, wide planked wood floors throughout, multiple skylights, barreled ceilings and modern fixtures. Fireplace in living room is decorative. Clean, bright kitchen with Viking appliances and built-in banquet. Smooth stucco exterior, private yard and detached finished garage." "Contemporary New Construction - immediate move in available !!! Best Value in this great pocket - Near Sawtelle restaurants close to both 405 & 10 FWY as well as New Google Westside Pavillion HQ. The volume created by the loft style bonus areas, glass railings, high ceilings and tremendous amount of light from the windows and doors make this house feel much bigger than the 2,854 Square Feet listed. Smart opportunity to own amazing home in great West LA location at a great price. 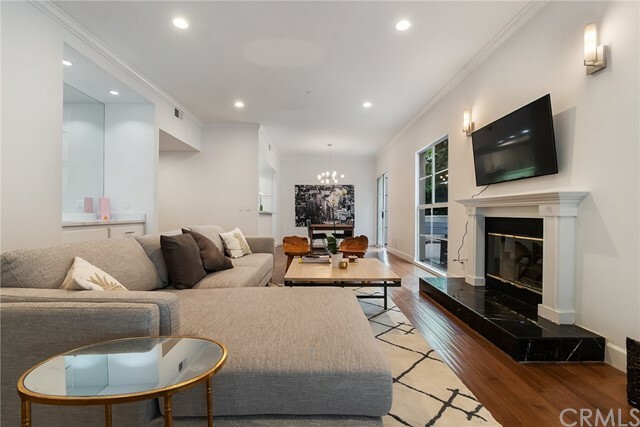 4 Bedrooms, 4 Bathrooms, 2 Bonus Areas, Private Garage, Private app 650 SF Rooftop - (Square footage does not include the rooftop nor garage)"
"Nestled on a charming local street in the heart of LA's Westside sits this brand new, 1-story penthouse w/ 4 beds & 3.5 baths. Engineered hardwood floor flow from the open family & dining room, into the gourmet kitchen w/ Silestone Calacatta Gold countertops, stainless steel farm sink, & built-in appliances. Large patios off the family room & master bedroom flood the home w/ ample natural light. Down the hall from the kitchen are 3 generous secondary bedrooms w/ built-out closets. Master suite feats. fireplace, private patio, walk-in closet, & stunning bathroom w/ Silestone Statuario countertops. Includes Private Rooftop deck w/ built-in BBQ & city views from Santa Monica to the Hollywood sign. Rest secure having gated entry & elevator FOB key, unit alarm system, Nest system, gated garage, & 12 security cameras. Wired for A/V in every bedroom plus 5.1 speakers in family room. Providing both exceptional quality & value, this stunning luxury unit can truly be called home." "Enchanting 4 bed/3 bath Spanish in highly coveted Westwood-Century City. Bright, airy & spacious, this home was extensively renovated with taste, elegance & extreme attention to detail. The inviting open floor plan is flooded with light throughout & creates a seamless indoor/outdoor flow perfect for your California lifestyle. Two master bedrooms that both open up to your peaceful garden and patio in the backyard. Kitchen features top of the line appliances, custom cabinetry & plentiful storage. Bonus space in the back with endless possibilities. Features include newer hardwood flooring, electrical, doors/windows, roof, plumbing, HVAC & foundation. The house includes a fully installed solar panel system so your electric bills are almost nothing. This home is an entertainer's dream & the perfect blend of modern luxury with character & charm. Incredible location; near Google's planned $360 million campus. Blocks from Westwood Charter School." "Nestled on a charming tree lined street in the heart of LA's Westside sits this brand new 2,165 sq ft contemporary condo w/ 4 beds & 3.5 baths. This gorgeous 1-story residence features engineered hardwood floors that flow from the open family & dining room, into gourmet kitchen w/ quartz counter tops, farmhouse sink, & stainless-steel appliances. Large patios off the living room & master bedroom flood the home w/ natural light. Down the hall from the kitchen is a walk-in pantry & powder room. Generous secondary bedrooms w/ built-out closets. Master suite features fireplace, private patio, walk-in closet, & stunning bathroom w/ quartz from Cosentino. Roof top deck w/ built-in BBQ & city views from Santa Monica to the Hollywood sign. Secure building w/ gated entry, elevator FOB, alarm system, gated garage, & security cameras. Wired for cable in each bedroom plus 5.1 speakers in family room & Nest. Providing both exceptional quality & value, this stunning unit can truly be called home." "Exquisite stand-alone townhome within The Villas Las Palmas. Traditional open floor plan includes 3bd, 3.5ba, kitchen, living, family & dining room. Quality craftsmanship and detailing throughout with vaulted ceilings, hardwood floors & natural stone. A cook's kitchen w/ granite countertops, center island, Viking appliances, & plenty of storage. Head upstairs to a landing with built-in desk & shelves, great as a home office or homework station. All 3 bedrooms are on the second level and the sizable master suite has its own wing where you can relax by the fireplace or read a book on the private balcony. Entertain on your front patio by fountain and greenery. Central location, neighboring Sawtelle Japantown, a convenient distance to restaurants, shopping, heading down to the beach or up to Century City! Wired for security, sound system & internet. Attached 2-car garage with direct entrance & additional storage." "Inviting and Charming English Cottage on a Very Desirable Street. Perched on the hill, close to Century City, this sunshine bright 3 bedroom, 1 and bath home will win your heart. This home has character and charm, starting with hardwood floors and a living room with barrel ceiling and fireplace. Formal dining room plus and interior sun room with French doors that opens to a fabulous oversized deck. Down from the deck is a wonderful backyard with a pool and spa area off to the right, and a grassy play area to the left. This is a really special backyard with loads of privacy. This home preserves much of it's 1925 original construction, but still offers central heat and air and updates to the bathrooms." "2BR/1BA SFR on a large 7,763sf lot in West Los Angeles off Santa Monica Blvd leased at $4,950/mo. Property can be delivered vacant for an owner-user. Lot allows two SFRs or duplex; buyer can live in existing home and build a second SFR for income or buy as an investment and generate 2.4% cap rate with excellent potential for appreciation." "Nestled on a charming tree lined street in the heart of LA's Westside sits this brand new 1,925 sq ft contemporary condo w/ 3 beds & 2.5 baths. This gorgeous 1-story residence features engineered hardwood floors that flow from the open family & dining room, into gourmet kitchen w/ quartz counter tops, farmhouse sink, & stainless-steel appliances. Large patios off the living room & master bedroom flood the home w/ natural light. Down the hall from the kitchen is a walk-in pantry & powder room. Generous secondary bedrooms w/ built-out closets. Master suite features fireplace, private patio, walk-in closet, & stunning bathroom w/ quartz from Cosentino. Roof top deck w/ built-in BBQ & city views from Santa Monica to the Hollywood sign. Secure building w/ gated entry, elevator FOB, alarm system, gated garage, & security cameras. Wired for cable in each bedroom plus 5.1 speakers in family room & Nest. Providing both exceptional quality & value, this stunning unit can truly be called home." "Beautiful, bright, spacious front facing unit with the view of historical homes in a quiet tree-lined street. Living room and dining room have white Carrera marble floors and double French doors. Recently remodeled kitchen with all Viking appliances and large breakfast area. Moroccan style powder room with cut glass tiles and Copper sink. Spacious master bedroom with fireplace and fully remodeled bathroom with an oversize Steam shower. The wall separating the other two bedrooms has been removed and turned into one big room and can easily be converted back into separate bedrooms. Adorable guest bathroom with claw tub. All three bathrooms fully remodeled with high end Walker Zanger tiles. Maple hardwood floors in the bedrooms. Laundry inside. Minutes to Shops and Restaurants .Easy access to the FWY, downtown, beaches and Beverly Hills. Easy to show"
"Luxurious single-story 3-bedroom 2.5-bath condo with open floor plans, wood floors & designer finishes. Chef's kitchen features high-end Stainless Steel appliances, granite counter tops and custom cabinetry. Recessed lighting in the high ceilings are accented by crown moldings throughout. Master Bedroom Suite boasts extra large walk-in closet, gas fireplace, and a spa-like bathroom. In unit washer and dryer. Building amenities include controlled access, fitness room with state-of-the-art equipment and gated subterranean garage with 2 tandem parking spaces. It is in a beautiful tree-lined neighborhood and conveniently located near UCLA and the Westwood Village, Century City, and Beverly Hills. It is in the highly sought-after Westwood Charter Elementary School district." "Centrally located townhome that has the space of a single family home in the heart of Westwood. Storage space galore throughout this spacious and well appointed unit. 2 bedrooms upstairs which includes a sweeping master bedroom suite, laundry with side by side washer/dryer. Downstairs has an open living room with dining area and an upgraded kitchen with breakfast nook and french doors and a cozy den/family room with fireplace and built-ins. Huge bonus of a side by side parking and a rare finished basement that could be used as a home office, playroom, movie room, gym, the possibilities of this space is unlimited. Walking distance to Westwood Charter Elementary School, Westfield Century City and easy access to UCLA, Beverly Hills, Santa Monica, the new Disney (formally Fox Studios) and the new Google complex coming soon at Westside Pavilion Mall." "This beautiful turn-key 3 bedroom, 3 bathroom Westwood condo is walking distance to UCLA, Bristol Farms, restaurants and Westwood Park with its sports courts and award winning playground. Send your kids to highly sought after Fairburn elementary. This tastefully updated unit is a rare find with 2115 sq ft of interior space, spread across a single floor, plus outdoor patio area, perfect for BBQs with friends. It is located on a cul-de-sac street north of Ohio with easy access to freeways, LAX, the Westside, Beverly Hills and the amazing shopping and restaurants of Westfield Century City. The property has high ceilings, two masters with walk-in closets and en-suites, huge living room and dining area, hardwood floors, new Quartz countertops in kitchen, wet bar and bathrooms; new fixtures throughout, freshly painted, new energy efficient LED lighting, a private Viking dry Sauna, and tandem parking in a secured area with convenient stairway access directly into the back of the unit as well as an elevator. HOA has redone roof and completed a full building termite maintenance in 2018. Air conditioning for the unit and stainless steel appliances updated within the last 2 years. A move-in ready must see!" "Ultra luxurious condo with a townhouse vibe in Westwood. Built in 2006, this 7 unit building has been designed with impeccable taste and details. This nicely updated 3 bed 3 bath unit is situated to the side of the building with complete privacy and serenity. Enter into a foyer leading to the powder room, built-in bar, living room, dining room, and updated kitchen featuring granite counter tops and top of the line stainless-steel appliances. Large master bedroom includes spacious walk-in closet and a full master bath with a jetted tub. Amenities include custom features thru-out, wood floors, fireplace, and a private patio perfect for having a cup of coffee while reading a book. Very close and walking distance to Bristol Farms, Sprouts, Aiden Park, major restaurants and shops."